Carl Hartung demonstrates ODK to a Ugandan shared phone operator. In the United States, Europe and much of Asia, millions of people swipe through the screens on their smart phones perhaps dozens of times every day to check e-mail, send text messages and surf the Web. While smart phones may also be coming of age in the developing world, increasingly these phones are being used for more than simple Twittering: in Tanzania, they're assisting health workers in the treatment of small children; in Brazil, they're helping forest-service monitors keep an eye on illegal logging; and in the Central African Republic, they're aiding investigators as they document violations of international humanitarian law. 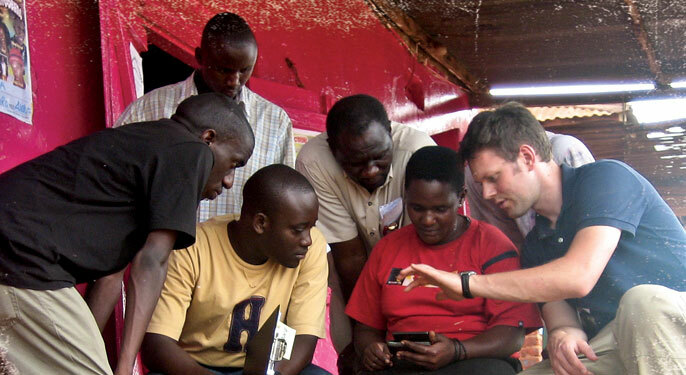 This ability to use mobile devices for social change is made possible by the Open Data Kit, a suite of tools developed by computer scientists and engineers at the University of Washington. Faster and more accurate than paper-based forms of data collection and analysis, and cheaper and open to wider utilization than other types of computer or handheld-device applications, ODK is enabling users around the world to quickly, efficiently and accurately collect and process data ranging from medical records to environmental dynamics. By using existing cellular networks, ODK's developers are freeing the devices' users from the constraints of limited infrastructure, enabling them to effectively use the tools in some of the planet's poorest communities. "In the developed world, people have ready access to an information infrastructure, both in terms of networks and the machines—laptop and desktop computers—connected to those networks," says Gaetano Borriello, University of Washington professor of computer science and engineering. Borriello notes that in most developing nations, this infrastructure doesn't exist, nor are there adequate trained human resources—such as physicians, technicians or other experts—available to analyze, understand and act on a huge amount of information, such as the data-entry and processing of medical records for tens of thousands of patients. What is available, however, is cellular networks and affordable handheld devices. With the assistance of scientists and engineers, along with government agencies and nongovernmental organizations, these tools can be adapted and maintained so they're both accessible and useful. "We can use cell phones to do two things," Borriello says. "We can connect and collect data and move it around through the cellular network; and we can take limited human resources in these developing nations and amplify them as much as possible. We give them the tools on these devices that help them do their jobs." Borriello has worked on the ODK project since its inception in early 2008, along with UW computer science and engineering doctoral students Waylon Brunette, Yaw Anokwa and Carl Hartung. Designed to maximize the potential provided by mobile devices, the ODK suite of tools enables users to do several things: to quickly and efficiently collect a wide range of data, such as medical information or details on a region's biological diversity; to process and share that data with a central database for further analysis; and to manage files and applications among multiple phones, so all participants on a project have accurate and up-to-date information. ODK's developers chose to use an open-source platform, making it possible for users to customize the tool—for example, enabling medical workers in Uganda affiliated with Johns Hopkins University to display videos on the phone for training purposes—as well as to share the data among different organizations and agencies, without encountering the tangle of licensing fees and cross-platform limitations that frequently plague users of proprietary software. By keeping ODK free and easy to use and adapt, the developers hope it will become widely popular, which should make the tool even more useful to a larger number of users. "People will be less likely to reinvent the wheel if there's this free software that can do something close to what they want to do," Borriello says. "And people who make changes to it can share them back, so others who need that change can use it as well." The project received a boost in 2008, when Google announced the development of Android, its open-source platform for mobile devices. ODK's developers quickly saw how useful the system could be. "When Google came out with the Android platform, we saw the opportunity to use the richer features it provides in terms of collecting data—not only text and numerical data, but also photo, video, audio and other features the phone can provide," says Carl Hartung, who worked at Google's Seattle office with Anokwa and Brunette to help develop this data-collection tool. Features such as GPS, video and photos provide a contextually richer set of data than is possible using typical paper forms, and the information can be shared and analyzed much faster than before. Hartung says the Android's open-source operating system makes it especially useful for tools such as ODK. "[Open source] provides a fair amount of customizability, and from a programmer's perspective, it's a really nice development interface," he says. "This is an aspect that's locked down or hard to access on other mobile phones, in terms of writing apps that use GPS or that take a picture. All of that is provided to you out of the box with Android, and it's lowered the barrier to entry to do a lot of these things with cell phones." ODK has found eager users in the field, and one of the earliest and most ambitious uses of the tool has been in a project conducted by Academic Model Providing Access to Healthcare (AMPATH), a partnership between Indiana University and Moi University in Kenya, funded by the U.S. Agency for International Development. A comprehensive HIV-treatment program in sub-Saharan Africa, AMPATH has been working with the development of ODK since mid-2008—doing field-testing and trials, and customizing the tool for their particular needs—and began using the tool in the field this spring. Medical workers in Kenya conduct house-to-house visits doing HIV counseling and testing They then use ODK-equipped smart phones to track patients' medical histories (accessed by using the phone to scan a bar code on a patient's ID card) and upload information directly to the Open Medical Records System, or Open MRS, where it can be viewed by physicians and other health-care workers. They are also extending the use of ODK's forms with audio and video capabilities to help diagnose and treat a range of health issues. By taking these tools directly to the home rather than waiting for an infected person to seek treatment at a clinic or hospital, AMPATH aims to stop the cycle of HIV transmission, while providing primary health-care services as well. While AMPATH started as an HIV-care initiative, tools such as ODK may help it extend its program to provide comprehensive health-care services to more than 2 million people. Dr. Paul Biondich, director of informatics for AMPATH and an associate professor of pediatrics and medical informatics at Indiana University, says ODK offers a solution to challenges medical workers in the field haven't even anticipated. "When you're dealing with emergent health-care systems, it's almost impossible to predetermine exactly what your needs are going to be from now until six months from now," he says. "One of the benefits of Open Data Kit is it provides flexibility and allows you to attend to the needs as they emerge. When people think of software development, they build specific solutions for specific needs; when you have a generic framework like ODK, it empowers local environments to evolve in ways that don't make you build it from scratch every time." Biondich says there's a larger aspect to building a tool using an open-source platform than simply easing its use and adaptability; he says ODK is valuable not simply for what it does, but for what it represents on the part of the developers. "There's an under- appreciation in academic settings for developing community goods," he says. "Being an academic myself, I see there's a tendency to hang onto things and claim credit for them, but I think this particular team saw there was a longer-term, bigger payoff in making the work they produce more generally available, and going further than that to make everyone feel as though it belongs to them. That kind of forward thinking is something that academic settings should understand more and more." To make ODK useful to an even larger audience while bringing more computer science and engineering students into the process, Hartung and Anokwa co-taught a course last fall, Mobile and Cloud Applications for Emerging Regions, in which students learned new skills and applied them to features requested by ODK users. By continuing the process and by making the tool as user-friendly as they can, ODK's developers hope to make mobile communications an integral part of improving the lives of millions in developing nations. "One of the measures of success, I think, is when someone with some technical knowledge is able to download and use our stuff without any need for a highly trained technical worker to set it up," Brunette says. "If a computer-savvy doctor or botanist or geologist can download it and set it up by themselves, and they don't require hiring an IT expert, then we know we're really successful." —Paul Clarke is a Seattle-based freelance writer and editor and author of the blog The Cocktail Chronicles.